As the home of Coney Island, the state of New York lays claim to one of the world's first and most famous amusement parks. Brooklyn's venerable seaside fun center is still chugging along after all these years. And there are plenty of other parks spread throughout the state. Find info to plan your next visit to a midway. Parks are arranged alphabetically. The medium-sized park is geared mostly to younger children. It includes a steel coaster and a few other thrill rides. As an interesting aside, although it was the setting for the 2009 movie, Adventureland that starred Kristen Stewart and Jesse Eisenberg, Kennywood, an amusement park near Pittsburgh, was used for location shots. The classic amusement area has had its ups and downs through the years. Over the past few years, it has been on the upswing with new rides and investment in the boardwalk landmark. 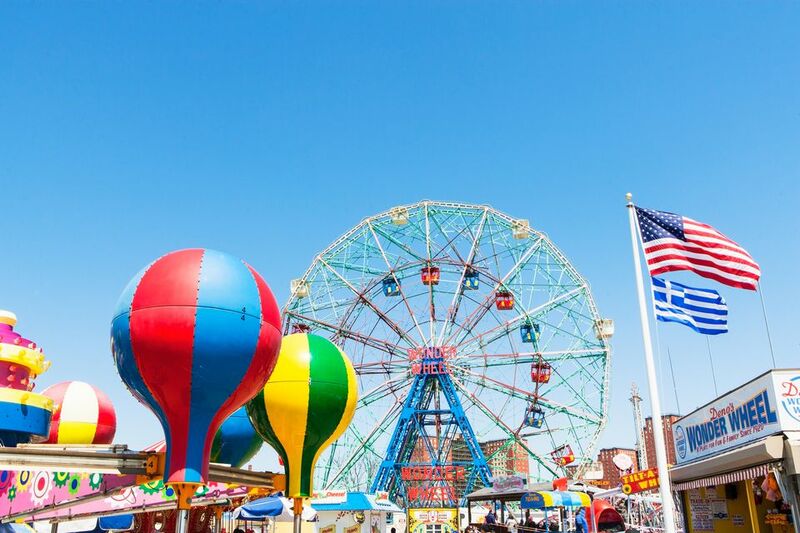 Coney island has never been a single park, but a collection of attractions. The primary operator is Luna Park, which operates the famous Cyclone roller coaster, the Scream Zone thrill rides, and the newer Thunderbolt steel coaster. Other highlights include Deno's Wonder Wheel Park, the original Nathan's Famous, and the B&B Carousel. The major amusement park features the Ride of Steel hypercoaster, the launched Orange County Choppers MotoCoaster, and a good-sized water park that is included with admission. The destination resort includes a hotel, a huge campground, and a major performing arts center that welcomes major acts each summer. Primarily a water park, the dry rides at Enchanted Forest include a carousel, Ferris wheel, and kiddie rides. Adjacent to the park is an arcade, go-karts, a zip line, and rock-climbing attraction. The resort includes an inn and a campground. Owned and operated by Six Flags, The Great Escape is a major theme park with thrilling rides (including the wonderful, classic Comet wooden coaster) as well as fairytale lands and attractions that reflect its origins as a park for young children. It also features a large water park that is included with admission. Adjacent to the outdoor park is ​Six Flags Great Escape Lodge, an indoor water park resort that is open year-round. Improbably, the small amusement park is located next to and operated by a furniture store. Most of the rides are for young children. The handful of family rides include a Scrambler and a Tilt-A-Whirl. Geared to the younger set. Magic Forest is much more laid back than the nearby The Great Escape. The modest park includes kiddie rides, a petting zoo, and shows. This medium-sized amusement park features The Silver Comet wood coaster, plus other thrill rides and kiddie rides. It also includes a wave pool and some water slides. Midway is a charming small trolley park with a vintage carousel, kiddie coaster, Tilt-A-Whirl and other classic rides. It is located inside a state park. Rye Playland is a classic, historical park (it is registered as a National Historic Landmark) with original art-deco architecture and ambiance. Rides include the Dragon wooden coaster, a beautiful carousel, a freefall ride, and a splashdown ride. It is located on a seaside boardwalk. Santa's Workshop is a small, Christmas-themed park with a few rides and shows. It is open in the summer and some weekends before Christmas. This medium-sized park on Lake Ontario features the classic Jack Rabbit wooden coaster and the Quantum Loop steel coaster. It also includes the Raging Rivers Waterpark. This is a small, amusement park on the shores of Oneida Lake. It includes LaffLand, a classic Pretzel dark ride. (Pretzel was a company that manufactured many haunted-house-like dark rides, few of which remain in operation today.) It also includes spinning rides such as a Tilt-A-Whirl and a Rotor. This is a small, free-admission park with rides geared largely to younger children. It also offers face painting, storytelling, clowns, and interactive games.